A huge part of the holidays involves eating, but make sure not to share with your pets. Too much fatty, rich or even just new types of food can lead to digestive issues. Some foods, such as chocolate, grapes and onions, are especially poisonous to dogs, and if ingested can lead to death. Avoid giving your pets turkey bones. When cooked, chicken and turkey bones become extremely brittle and can splitter when ingested. This becomes a choking hazard for your animal. Do not leave food wrappers, such as aluminum foil and cellophane, lying around. They smell delicious and enticing to your animal, but if ingested, can cause vomiting and intestinal blockages. Too much alcohol is bad for us, but even the slightest amount can hurt your pet. Keep the alcohol to yourself. Alcohol can cause a pet to go into a coma, possibly resulting in death from respiratory failure. Make sure your pet has access to a clean water bowl. Be sure all of your guests know the house rules about feeding table scraps to pets. A number of holiday season plants are toxic or can cause digestive upset to pets if nibbled or eaten, including ivy, holly mistletoe, poinsettias and lilies. Be sure all of the plants are kept out of reach of pets. Make sure that your Christmas tree is properly secured so that if your pet gets curious, the tree does not fall over. Christmas tree water may contain fertilizers that can upset your pet's stomach. Stagnant water can also be a breeding ground for bacteria. Make sure the water is not accessible to your pet, and that they have their own clean water available to drink from instead. Clean up any fallen needles as they are sharp and can get stuck in your pet's paws or throat. They can also cause digestive issues if ingested. Avoid using decorations like ribbon and tinsel, or when used, keep out of reach of your pets. If ingested, these materials can become lodged in their intestines and cause an obstruction. Keep extra cords and plugs, which are tempting to chew in, to a minimum or hidden. Taping down or covering cords will help prevent shocks, burns or more serious injuries. Dangling tree ornaments are tempting toys for both dogs and cats. Be sure dangerous ornaments, such as breakable glass or those with small pieces, are hung out of reach on high branches and very well secured. Our pets can get just as stressed with increased house guests, noise and activity as we can. Loud noises such as fireworks, Christmas crackers, poppers and balloons are especially terrifying. Make sure your pet always has a quiet secure place to escape the commotion. Pets thrive on routine and increased activity or visitors during the holiday season can upset that routine. Try to keep your pet on his regular schedule for feeding and exercise and be sure they lots of love from you. Guests coming in and out of your home will be at a peak, and this increases the potential for pets escaping through open doors. Keep your pets safely indoors and always make sure they're wearing current ID tags and that their microchip information is up to date, just in case! If you are hosting at your house, make sure that all of your guests know the rules when it comes to your pets. 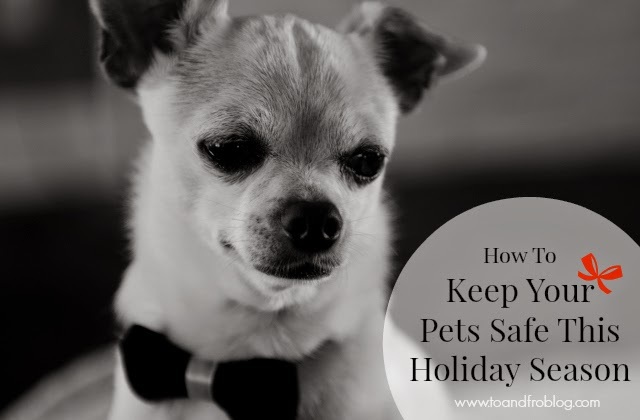 Do you have any additional tips to keep your furry friends safe? So important to keep an eye on what they're eating! Thanks for sharing, girl!